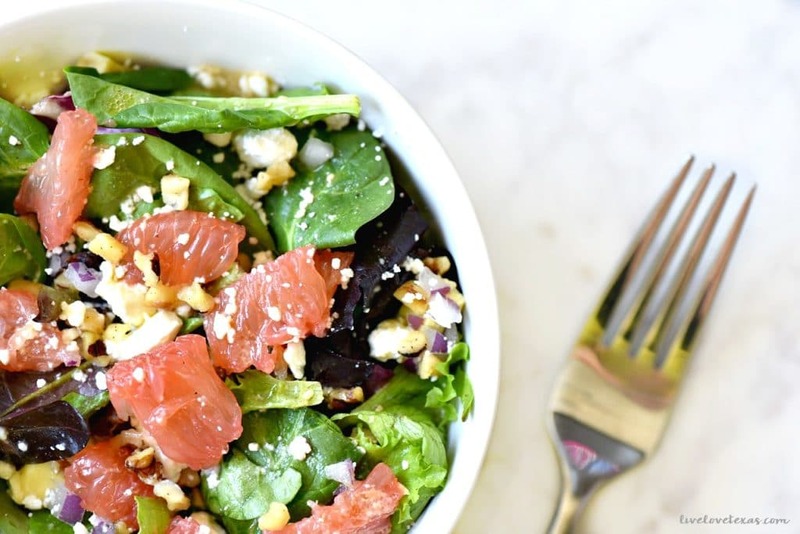 This grapefruit spring salad recipe with grapefruit, avocado, feta, onion, and walnuts topped with a simple grapefruit vinaigrette dressing recipe was created as part of a sponsored campaign on behalf of Sweet Scarletts and Millennial Blogs. Today marks the first day of Spring Break in Austin! It may not officially be spring yet but the signs are all around us. Aside from some crazy storms that swept the south last week, the temps have been warming steadily and what little winter we had this year is long gone. The trees have already gotten their leaves, flowers are blooming, and the high today is 93. While a majority of the country will still be battling snow or at least cold temps for several more months, we’re preparing for the longer days and warmer weather. We can no longer hide that extra 5 or 10 pounds of lingering holiday weight under bulky sweaters and leggings. Getting ready for spring means heading back to the gym on a regular schedule. My lazy, post holiday once a week trips are not going to cut it if I want to see real change before it’s time to don my bikini. Which, based on today’s forecast, seems I’m in a race against the clock (er, calendar) to get it done. Working out alone isn’t going to get me where I want to be. Life’s been busier lately and I’ve been enjoying far too many nights off from cooking in favor of eating out at our favorite pizza restaurant, but I’m trying to get things back on track. Whenever the urge to get back in shape and more disciplined strikes (about the same time every year), I don’t research any crazy diets or quick fixes. I know that discipline and whole foods are the way to go so I try to stock up so there’s never an excuse to not eat healthy. Let’s face it. Eating salads can get old. Fast. But I know they’re good for me, so I like to constantly change up the toppings and dressings I use so things are always different and I don’t revert to my old ways. My current obsession to add to salads is fruit. Not a fruit salad, but a green salad with fruit. There’s something about that little sweetness in an otherwise savory salad that just makes it such a treat. 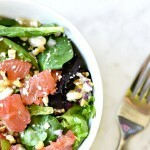 Grapefruits are in season right now so I was able to snag a 5 pound bag of Sweet Scarletts for super cheap and when I’m not snacking on them as is, I’ve been adding them to other dishes like this grapefruit spring salad recipe topped with homemade and super simple grapefruit vinaigrette dressing. Starting with the spring mix, split toppings evenly among four bowls. Drizzle with 1 tbsp. 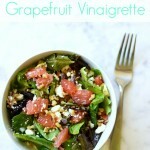 grapefruit vinaigrette dressing and serve! 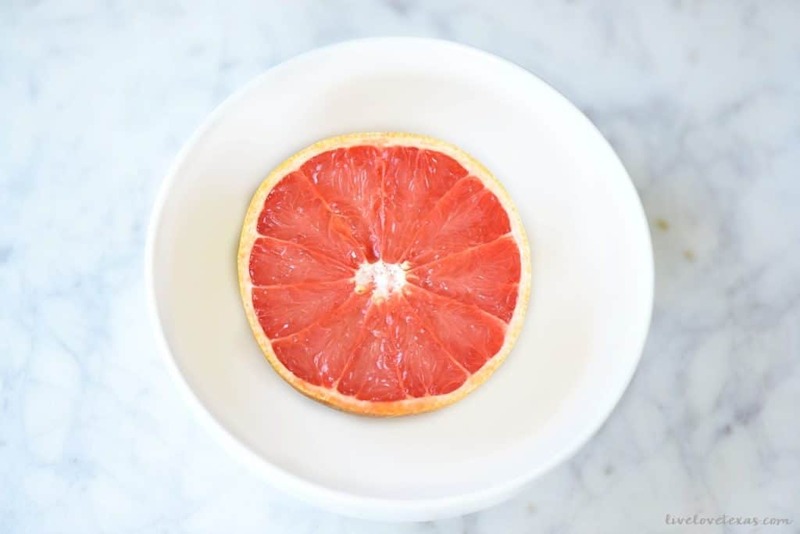 Juicing a hand juicer, squeeze 1/2 of a Sweet Scarletts grapefruit into a bowl being careful that seeds are excluded. Whisk together remaining ingredients until fully combined. These grapefruits are seriously so good, I’m also adding them to my water. My husband carbonates water for us in a keg so we always have fizzy water on hand. But sometimes I like a little something different but I don’t like the artificial sweetness that store bought brands bring. 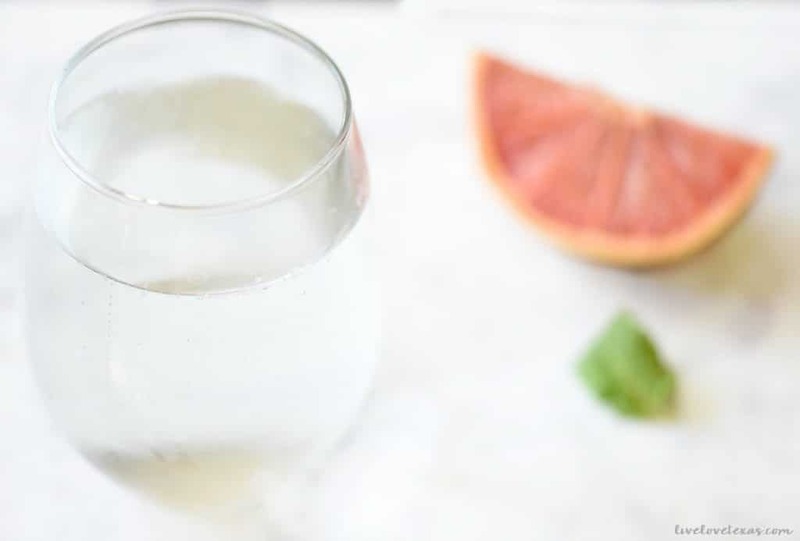 Instead, I’ve been infusing my water with the natural sweetness of grapefruit juice and fresh mint for a refreshing drink! 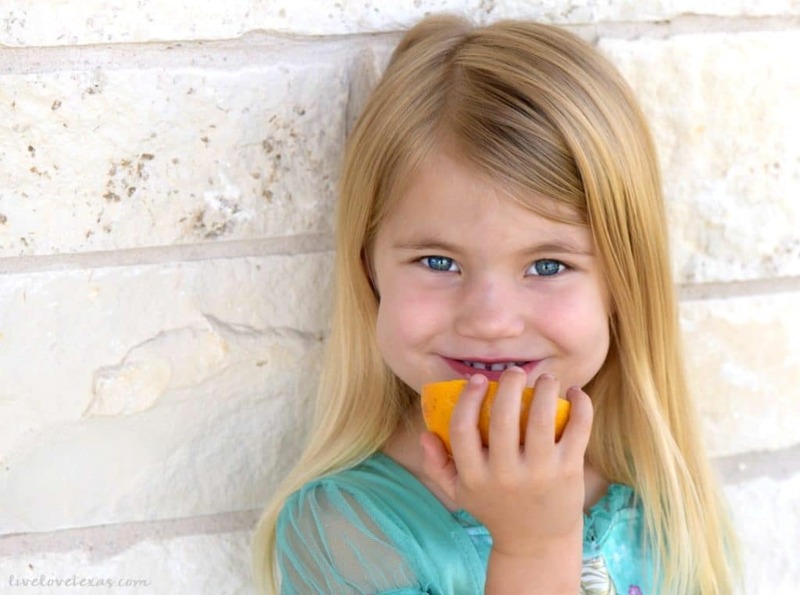 But I’m not the only one on a grapefruit kick, my 4 year old is sneaking them whenever she gets a chance. And will happily accept a Sweet Scarlett over junk food – that makes this mama happy! 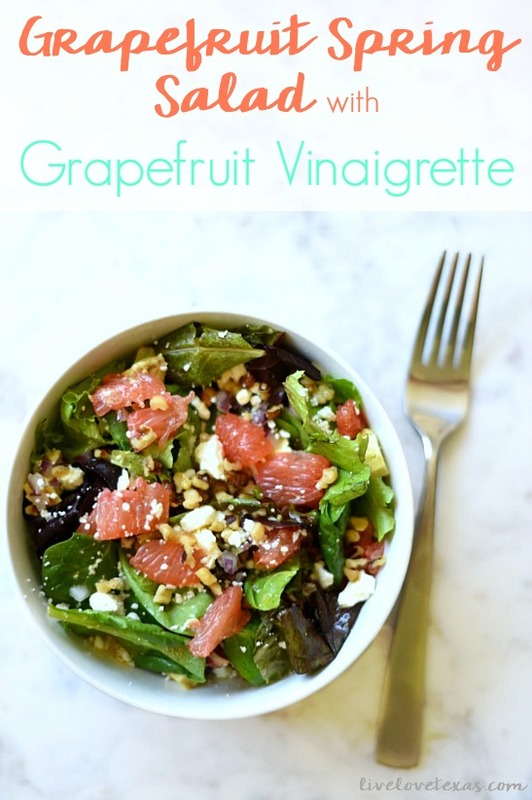 If you enjoyed this grapefruit spring salad recipe, be sure to check out the Sweet Scarletts product locator to find a store near you!